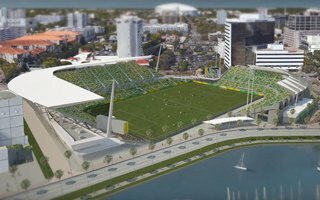 Tuesday’s referendum in Saint Petersburg, Florida saw vast majority of respondents in favour of the proposed Al Lang Stadium expansion. The referendum, which won approval with 87% of the vote, will allow city officials to begin negotiating a 25-year lease with Tampa Bay Rowdies owner Bill Edwards, who wants to expand the stadium's capacity to 18,000 seats. More importantly, no public money will be required to complete the renovations, with Edwards' investment group prepared to pick up the entire $80 million price tag. The expansion fee, expected to be around $150 million, will also be privately funded. The investments are contingent on St. Petersburg being chosen by MLS to fill one of four expansion slots. "I am grateful to the citizens of St. Petersburg for passing this important referendum," said Edwards via a press release. "St. Petersburg is very protective of our incredibly valuable waterfront – as is appropriate. We have put together a stadium plan that enhances our downtown, is of a scale that is respectful to our waterfront and does not burden the taxpayers." St. Petersburg is part of a 12-city competition to see which locales will fill the available expansion openings. MLS has said that it will select two cities by the end of 2017, with another two to be chosen in 2018. The other contenders include Sacramento, San Diego, Phoenix, San Antonio, Detroit, Nashville, Charlotte, Raleigh/Durham, San Antonio, St. Louis, and Indianapolis.